Live Polls - Motorcycle/Site Related Let your opinion be known! Poll: How many lifetime flats have you experienced? How many lifetime flats have you experienced? Here is one that I remember you fixing Vic, along with the advertised patch kit that you used. Yeah, I labeled it "How many guys does it take to...."
Back at the shop, removing the plug for a patch will probably not work. But, probably doesn't need a patch. Used my kit on three occasions since then on modern wheels. So much better!!!! I wouldn't even entertain the thought of owning a motorcycle with rims requiring "tube'd" tires anymore. Ride safe, happy and long! Big o'l chrome engine-bars w/ highway pegs. CRAZY LOUD "Denali" air horn. I've only had 2 flats...both on PR-II's on the rear. One a 1.5" cut that I never felt hitting a thing. The 2nd last month, 3 slow leaks, dug out 3 small pieces of aluminum about 1/32" or so square that had worked through the tread, carcass and appeared to be shavings from a project for the motorhome. It took 6 Stop-an-Go plugs to get 3 that did not leak. 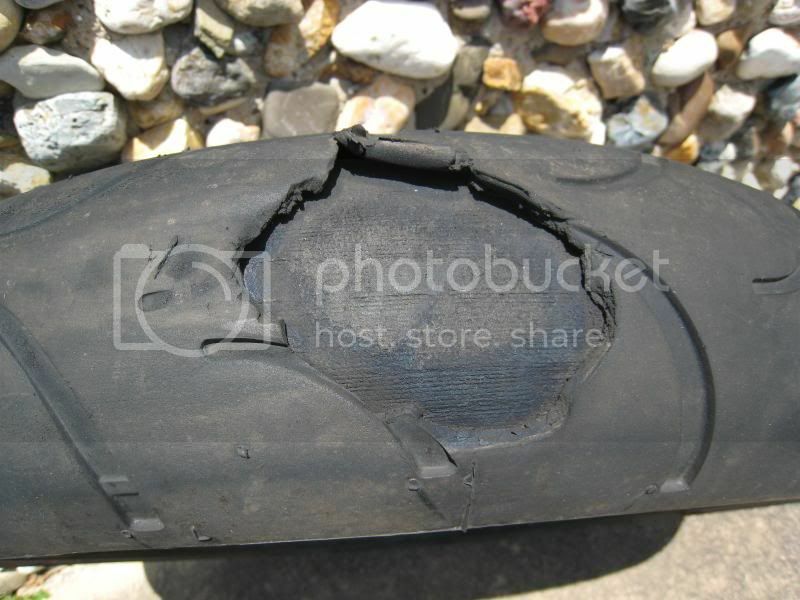 Never again buy Michelin motorcycle tires and the Stop-an-Go is for sale for 1/2 price. Sarcasm, because you cannot beat hell out of every idiot who desperately deserves it. Wow, I'm surprised by the results so far. Shows that modern wheels and tires are so much better than us old-timers had to endure in the spoke wheel and inner tube days. Granted, most of my flats were on off road bikes, one memorable one did occur on my K75s. Very scary and I hope those who have never experienced this never do! Bad Tire ... very bad tire. Had just one flat tire. Was going to another town after dark. A semi was passing a slow lane of like 30 cars. With no regard for oncoming traffic. At my right there was a steep bank, probably a cliff, and just like 6 feet of shoulder. I had to move out, the truck wouldn't stop. Went to the shoulder, no road there, it was broken asphalt and LOTS of sand. Praying I wouldn't go to the cliff. Somehow my front tire cleared a huge pothole, but the rear was hit hard, and started a leak. The leak got worse about 10 clicks down, and was left stranded. Friend tried to rescue me with a compressor, but there was a large hole now. Rode the bike completely flat for 20 kilometers until his house. Rim was not damaged, the bike was near impossible to ride though, wouldn't turn. Bought a new tire... then we found that the rim actually had a big bent where it hit the pothole. Use a wooden block and a 60-lb hammer and bent it back into good enough shape. Mounted the new tire and off I went. I sent both these rims to be rectified... a decision I still regret. They look all neat and pretty, but I know they were heated with a torch and coerced into shape. I've had four flats, two I found in the garage. I'm always checking my tires. One flat I had on a Honda 750 four a century ago, I used a can of foam tire filler. Kept the tire on till it wore out! They were junk tires back then too. I live north of Seattle 50 miles in Mount Vernon. In an effort to help keep bikes on the road at a reasonable price I do tires for $40. Ship to my place, ride here I remove your wheels install and balance new tires put the wheels back on the bike and give things a look over. Of course time and dates need to be worked out as I ride too. Bought a new Coats rim clamp 150 power tire machine that helps things. BMW's only, K bikes, 1200GS and RT's are the main focus. Tube tires you have to bribe me somehow. PM works then normal email. What ever happened to steel-belted or poly-glass carcasses that were resilient to punctures? Less than 200 miles after recently installing a brand new Dunlop Q3 I got what looked like a tiny needle bearing that penetrated. When I went to plug it the "plug" installation tool went into the tire and through the carcass as if the puncture was caused by a 3/4inch diameter drill bit. About 20 miles later the plug came out and the tire was toast. I've "pluged" many a puncture on tubeless motorcycle tires over the years. Usually they afforded moderate to concerted force to get the plug all the way in. Is it possibly just the Q3's, or are all contemporary "sport" tires commonly sacrificing a hearty 'tougher than nails' carcase for feather light, non-repairable construction? A friend convinced me to go to his farm in Costa Rica. 20 km of rocks and steep dual worthy roads. The power pilots were losing air after coming and going to his farm. Made it back home 700km away. There were 32 punctures in the tire. Toast! It's very repairable though very thin and light. Metzler M5, Z8's still have steel belts and are tough to plug most of the time. Not puncture resistant though. I've been doing some research into the Shinko brand. The 011 Verge has a steel belt at 0*, a mostly radial rain groove pattern(less tendency to "cup", and is quantifiably less expensive than the 'name brands'. Handling performance wise the Q3 is the best tire I've ever spooned onto my hoops. But if they are going to be exceedingly vulnerable as well as non-repairable in addition to a sub 4500 mile service life I'm simply going to shop elsewhere. In my youth I would ride tires until they went flat. I grew up riding dirt bikes crashing all the time, with a smile. Now I put new tires on every year for my road trip. I just don't want the trouble when I get the time to ride instead of working. Richard. Because of recent experience I invested in a proper adapter with brass ends for connecting threaded CO2 cartridges to the tire's valve stem as well as replace a couple of CO2 cartridges that have been rattling around under several different seats for the last 20 years. In years past I was usually within a city block of a gas station with "air". But my rides are now much more rural, with several miles between service stations. I vacillated over a compact 12v air pump; but the 'cartridges' are far more compact, less costly, and by appearance have less to go wrong mechanically or electrically at time of emergency. Just one. In the early nineties, on my MBX125. Didn't realise tyre was flat as I hurried to the pub one night and slid down the road on my arse narrowly missing the village shop. Happy times! Just had the first one I've experienced in many, many years, on the way home from Death Valley a couple of weeks ago. Got to use the "strings" and the little compressor I've been carrying "just in case" for I don't know how long, glad to have had it with me at the time. A friend suggested "Dyna Plug" as he had a good experience with it. http://www.dynaplug.com/ may pick one up for the next time - hopefully many, many years from now. Nothing like having the NPS open up their maintenance shop on a cold and rainy Sunday. (original post here) Rules, after all, were made to be broken. I can make out KevinC, LI Ralph and Vic....who are the other guys Larry? Don't. Stick with some fresh strings and a unopened glue tube. Or get one of the few true vulcanizing kits out there. If you take a tire that has been repaired with a Dyna Plug and push on the plug it can pop into the tire! One is Vic's buddy Shiva. Inside patch is the real way to go for long term. I suspect the rubber cement for the strings contaminated the hole and prevented the vulcanizing chemicals to function at 100% for its rubber string. Cleaning and removing the internal ridges for the internal patch ought to do the trick. Could be , I'll be carrying the vulcanizing kit on the bike for the future, which I will hopefully not have to use! 2 up 40 mi from home. front tire. With short drag bars, 2 up, front flat, was a real wrestling match. Well after over 30 years without a flat I have just had two in two weeks, first the rear on the R1200RT, screw went in at an angle ripping a largish hole so wasn't able to plug and keep going so trailer job and new tyre then a week later the rear on the F800R, that I plugged and got home ok, putting a new tyre on today though, the TPMS on the little 800 worked exactly as it was meant to, gave me sufficient warning to be able to stop safely in a spot that was well off the road, plug kit worked very well, I carry a kit on each bike, the 1200 has the rubber mushroom type plugs and the kit on the 800 is the string type, they're actually quite easy to use and the CO2 cartridges worked a treat though I did have to use five to get her up to 39psi, took off and according to the TPMS she slowly leaked down to 36psi but after about 3kms she held there, was still showing the same this morning but I may just be paranoid I'm fitting a new tyre as I don't trust the longevity of the fix! To be old and wise you must first have been young and stupid! I had a flat on my 89K100RS on the Detroit freeway system. I had run over a muffler clamp from the citizens in the area. After reading an article on options for repairing flats I commented to my wife that I have never had a flat on my bike. I came out from work the next day to find a roofing nail in the back tire. I'll learn to keep my mouth shut. Cleaning and removing the internal ridges for the internal patch ought to do the trick. 1) Yes, buff a rough spot. Notice I didn't say "smooth"... or "Smoove". Remove internal ridges, be carefull NOT to buff down to the cord. 2) Make sure you buff an area BIG enough for 2 patches. Yes, two (2). 3) Slather on some vulcanizing cement. Let it dry to the point where it feels like sticky tape. NOT wet. 5) Now place patch 2, standard tire patch. All patches should be within the sticky buffed area. 6) Now use your stitching tool, that little metal wheel thingy on a handle. I do NOT use to use this patch anymore. This is really a car tire patch. Car tires are very stiff, motorcycle tires are not. Motorcycle tires flex so much that they eventually work this patch loose just enough to create that irritating slow leak. Ya know the one, air up your tire and 2 weeks later it's just a bit low. ALSO!!! Some people do NOT clean off the wheel bead grunge enough. I always brush clean the wheel bead. I've seen some horrendous build up. I always brush clean the wheel bead. I've seen some horrendous build up. Yes! Oh so common on a bike that has gone through many tire changes. Picked up my K13S in Las Vegas in April of this year. The rubber wasn't new but looked like it had enough to get me home safe in Ohio. Rode to Pasadena, CA before heading east back home via the scenic route. CA 2 Angeles Crest Hwy to start out, Grand Canyon, Four Corners and some play time thru Colorado. Got on I-70 in eastern CO and set out to cross Kansas. I had a look at the tires before leaving CO and they still appeared serviceable. I was in and out of rain and wind slugging east bound along I-70 when the back end gave out at speed. I pulled in the clutch, prayed to stay upright and hoped that I wouldn't have to much trouble pulling the seat cover out of my puckered backside. I spent the next 3 hours in the rain, waiting on the shoulder for a tow truck to be arranged by AMA road service. Ultimately I ended up calling the KS Hwy Patrol for assistance and a tow as I was running out of daylight at that point. Spent the night in Salina, KS. I was able to get fresh rubber from an independent shop the next morning. Had I put fresh rubber on in NV or CA I would have avoided this whole mess as the rear tire had got too thin to resist the smallest puncture. Normally I'm all about preventative maintenance and wouldn't think of making a cross country ride without new tires. The TPS sensors were both in need of new batteries(DIY) and I could get tires and free install back home so I let that sway my judgement. Go cheap and it will cost ya! Oh yes. I remember it well! The two of us riding in Mystic , Connecticut on our new model year "king of the road" at the time, Kawasaki KZ 1000a bikes. (1977) (still own the bike today) I was in the fast lane going too fast, with a car right there very close behind to me. Had a rapid puncture in the rear and the bike did this radical back and forth whip snake dance that scared the crap out of me! Luckily, my instincts told me, don't brake, just keep her in lane and come to a stop. The tire was trying to come off the rim, so steering was very scary. Fortunately, it was a short ride on the back of my friends bike to a nearby dealer. I learned my lesson comming back from Mexico riding two up. I thought I had lots of rubber, but didn't anticipate the rougher roads, and crazy speeds we traveled at. The tires did hold up, but the last few hundred kilometers didn't make for a pleasurable ride. The tread was gone by the time we got back to San Diego. We all know that fast speeds, hot weather and rough roads are trouble. But my point is the last miles of a tire go so fast compared to the first miles on the tire. You can look and think well there is some left but that does not count. It will be gone in a wink. Don't start your long looked for trip on worn tires, put some new ones on. Got two flats in my riding. The first one I was with my bro and he noticed my rear tire was flattening as we were driving to Cape Cod on the highway. Major pita, no repair kit mad scramble for inflatable gunk repair to get to a pump and then to find a plug kit. Second one was solo. I tried to make it to my cottage 67 miles away on the Cape in less than 60 minutes. I was 55 minutes in and it looked good but 3 miles away I got behind two cars that would have killed my pace. Well the first car was taking a left and I had the chance to pass on the right to make time (single lane) and on the shoulder of the road my rear tire found a boat davit and punctured my tire. 60 minutes wasn't happening. Made the cottage at least. Bike sat for a week til I came back and picked it up.